This kitchen design is an example of balancing the needs of the homeowners with the tight spatial constraints common in renovation projects, and within a very modest budget. The owners are gourmet cooks and wanted a functionally efficient kitchen with improved access to the dining room and more natural light. The original kitchen space was only twelve feet wide and the number of doors and windows limited the amount of available wall space for cabinetry and appliances. The space was compartmentalized from the rest of the house, including the dining room, and could not be widened without great expense because most surrounding walls supported the roof structure. The basis of the design approach was to merge the dining and kitchen space. This meant removing the non-bearing wall between the kitchen and the dining room to introduce daylight and improve circulation. This allowed enough additional space to accomplish the project goals. 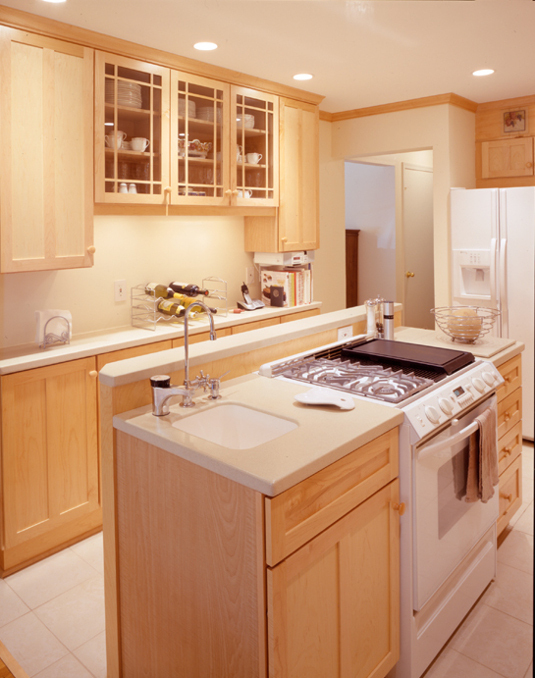 A food preparation island was designed that included the cooktop with a large work surface and a bar sink. The main sink and dishwasher were situated slightly beyond the island in a configuration that allowed two cooks to work together. 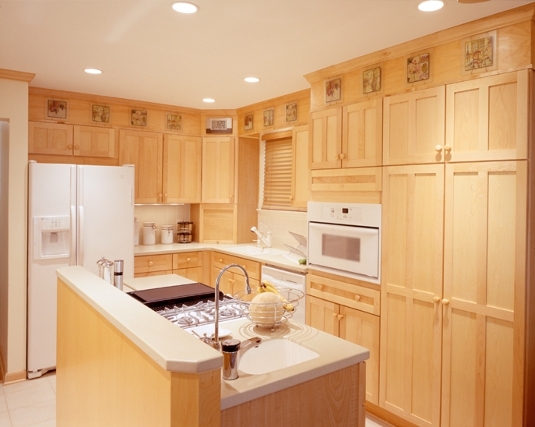 Cabinetry ran from floor to ceiling allowing for the storage of infrequently used, but necessary, cooking equipment above more easily accessed storage space for frequently used items. The use of the tall wall storage cabinets also allowed for a larger refrigerator and increased counter space; both high priorities of the owners. With the owners’ collaboration, the items stored in each cabinet were identified to guide convenient positioning of cooking, cleaning, and preparation work areas and storage areas. Light colors were used throughout the space to reflect light and make the space feel larger. The overall effect of the finished kitchen is one of a brightly-lit and functional space in which the owners are able to enjoy the pursuit of their culinary art and their entertainment of guests.